There are several newsworthy items to note regarding the Evanston Fire Department. This week Evanston completed the layoffs involving the three firefighters with the shortest time on the job. Evanston is in the process of interviewing candidates for the position of Fire Chief. Apparently the field is currently at five finalists. 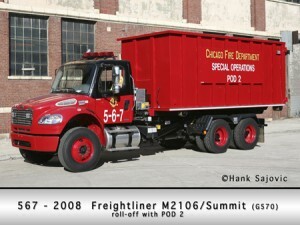 The Chicago Fire Department Special Operations Division apparatus and the Support Services vehicles have been added to the site. These two divisions maintain a number of vehicles in a warehouse located within several blocks of city facilities. 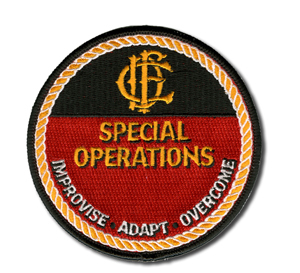 The Special Operations Division has units to supplement companies throughout the city for various types of technical rescues and large scale incidents. The Squad companies, hazmat units, Air Sea Rescue and many of the specialized pieces that are in firehouses throughout the city are all under the Special Operations Division umbrella. The engine and tower ladder being built by Ferrara for the Algonquin Lake-in-the-Hills Fire Department are moving right along. 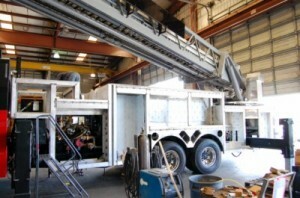 Updated production photos can be seen HERE showing that the aerial and body have been mounted to the truck chassis and the pumper body is ready to be mounted. A few readers have recently added comments to several posts, and the comments generally are only viewed if someone refers to the original posts. Recent comments can now be seen on the lower left margin of the page without having to seek out the original post. The Joliet FIre Department in Division 15 has 10 stations. They have 212 career personnel that are responsible for a city which is over 38 square miles. Only nine of the stations are manned as Station 2 houses the Fire Investigation Unit and the Dive Rescue Unit. 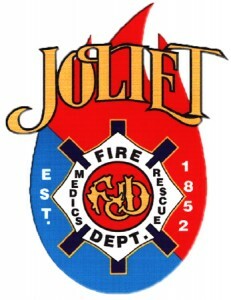 Joliet is an E-ONE department for 100% of their suppression units and a Horton department for EMS. They run two Battalions, two ladder trucks, one tower ladder, eight engines and six ambulances. 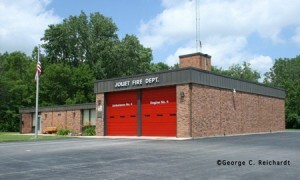 Joliet Station 4 is an example of one style firehouse utilized in the city. This is one of five similar houses. 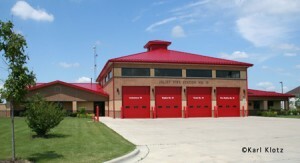 There are three Joliet stations featuring the same design as Station 10 shown here. 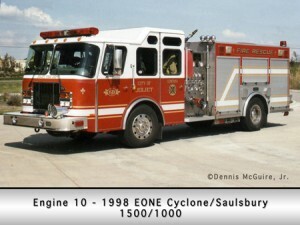 Engine 10 is a one-of-a-kind in Joliet featuring a Saulsbury body and an E-ONE Cyclone cab. Dennis McGuire, Jr., Karl Klotz and George Reichardt submitted the images to represent Joliet. 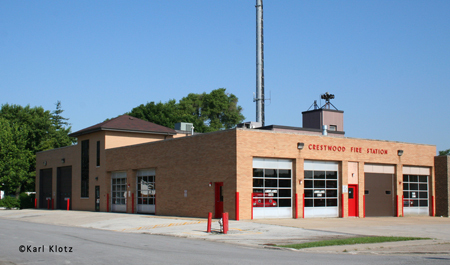 Crestwood's fire station featuring apparatus bays on two sdes. Many thanks again to Dennis McGuire, Jr. and Karl Klotz for supplying the images to post another department in Division 22. The Crestwood Fire Department has one station with three ambulances, two engines and a truck representing several manufacturers. They have a full-time chief and 25 part-time firefighters covering a little over three square miles. Their rigs are black over red. 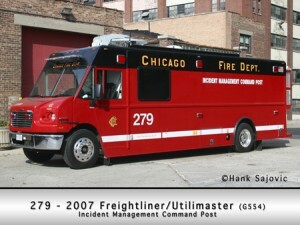 Another department in Division 24 has been added to the site; Dolton, with two stations. 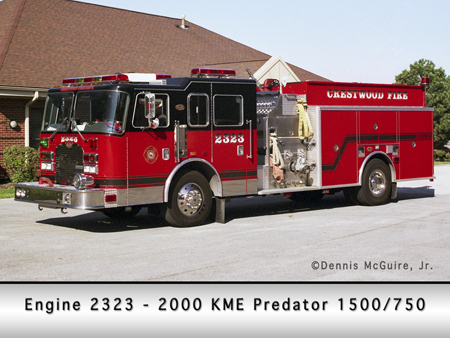 Apparatus images were provided by Dennis McGuire, Jr. and the station photos are from Karl Klotz. Dolton has 35 full-time firefighters and several suppression rigs. They contract EMS from Bud’s Ambulance Service. 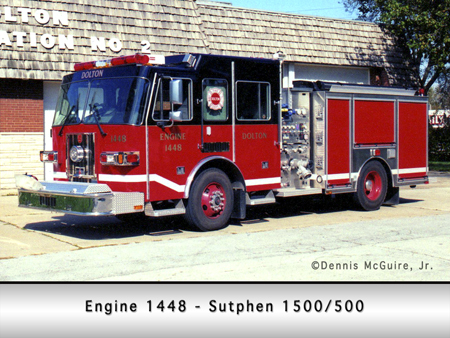 The frontline engines are from Sutphen as is one of the two aerial devices. Dolton has a beautiful backup engine built by Pirsch on a CF Mack chassis. 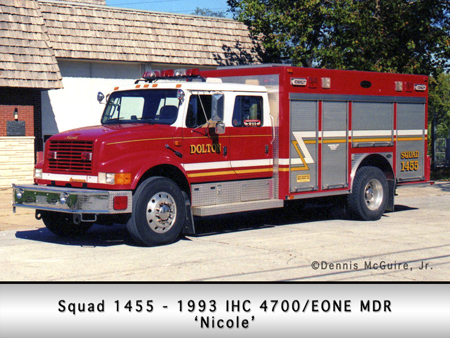 Dolton Squad 1455 is an IHC 4700/E-ONE medium duty rescue unit that the department won through a nationwide coloring contest for kids that was sponsored by E-ONE. The winning artist’s name was Nicole, and the squad was named in her honor. Dennis McGuire, Jr. sent in this link to the information listed below about the new Chicago Fireboat.